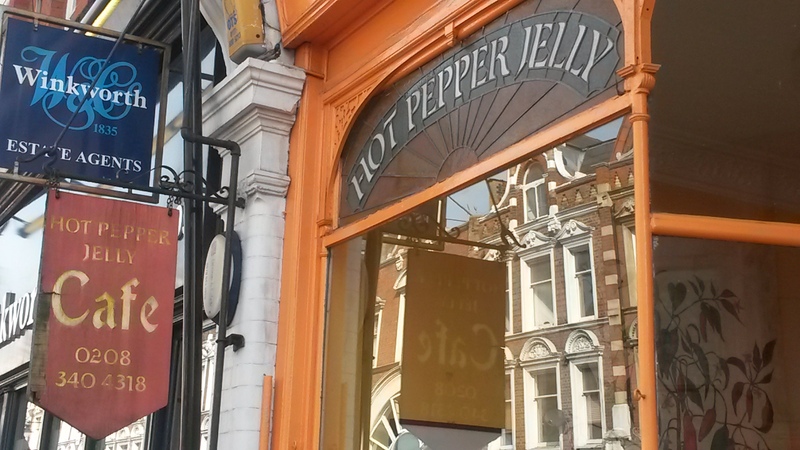 Hot Pepper Jelly was one of the original Crouch End cafes. Since it opened many years ago, a number of competitors have arisen and it’s taken some serious community support to keep this great little place going. Today, it seems to be thriving, mainly due to its quirky menu, a lot of which based is around the hot pepper jelly of its name. It’s also one of the few Crouch End cafes that offers an extensive menu. 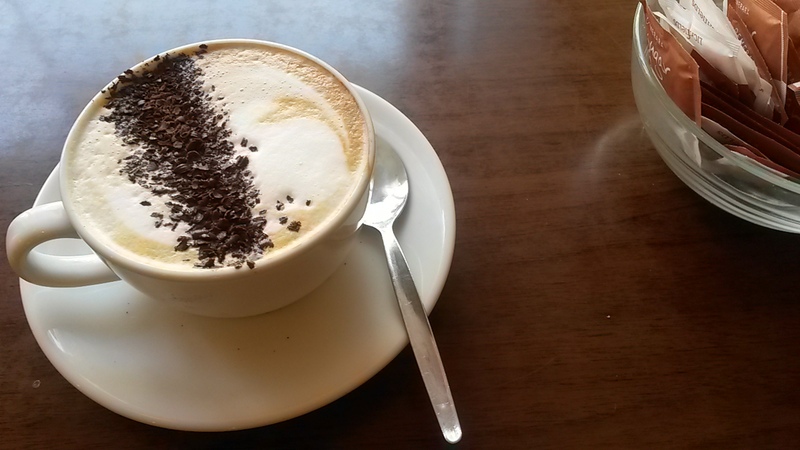 The coffee lives up to the name of the café – it was hot and potent. It comes with not a dusting of chocolate but a layer of chocolate shavings. As they are only on one side, you can avoid them. I like to scoop them off and have them almost as a separate treat. The coffee itself is a good size. I went for the small and it is a lot bigger than most regulars. And it’s only £1.95, which is frankly unheard of these days. The taste is subtle and gets a bit lost in the heat of the coffee but once it has cooled a bit some nice fudgy flavours come through. This is a small yet bustling place. Done out in bold primary colours with chilli pepper decorations everywhere, it’s somewhere in between a Mexican restaurant and Crouch End café. People are squeezed into its few tables and the kitchen stands open at one end. The front window, with its brilliant stained glass sign, gives you views over Crouch End’s busy high street. While there isn’t many seats, you never get ‘moved on’ and they don’t, like some places, give priority to diners over drinkers. I love the food here. They have developed a thematic menu based around its homemade hot pepper jelly while also finding space for some basics. The Deluxe sandwich, which features Peanut Butter, Crispy Bacon, Smoke Mozzarella and Hot Pepper Jelly, is truly something to behold – it’s a once in a lifetime sandwich, which basically means that’s probably all you could manage. They also do excellent breakfast options. 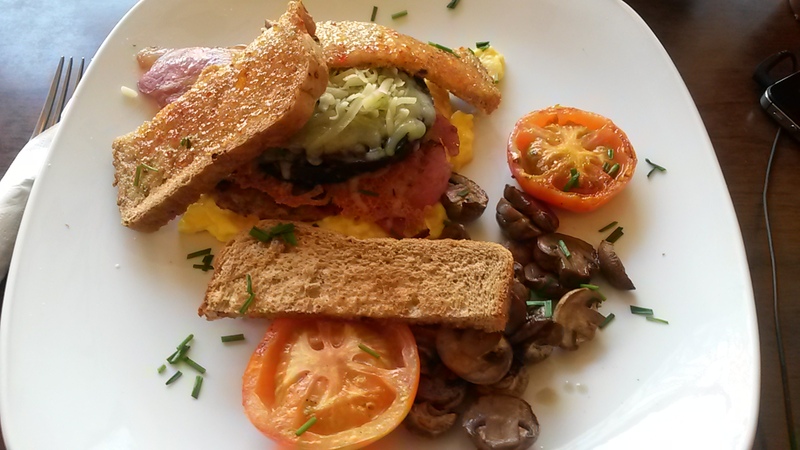 I chose the black pudding stack, which was a big pile of goodness. It also offers salads, smoothies, soup, nachos and more. It’s an extensive menu but the place still keeps the feel of a café over restaurant. This is a family run place and you feel it in the service. When it’s busy it’s like being at a big family event, with waitresses running around like mad things but always looking happy to do so. I was served the moment I sat down and the food came pretty sharpish. It always has some great art for sale here. In the past, there’s been pieces by local primary school kids and more recently it is the works of local photographer Matt Cooper, who has captured local landmarks. 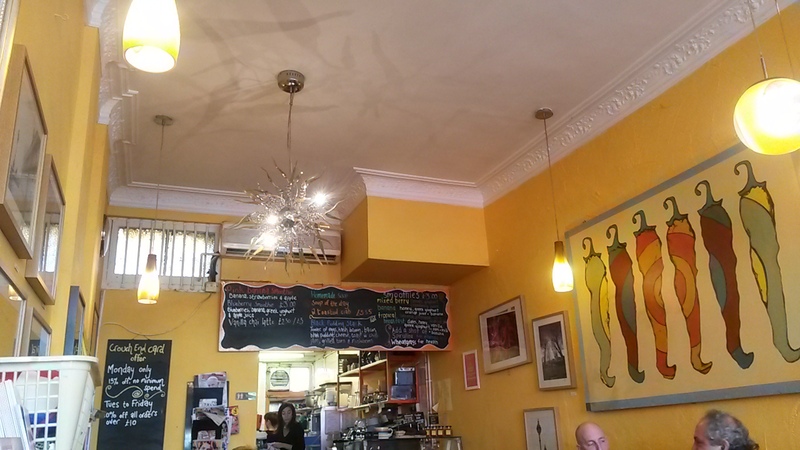 They are also part of the Crouch End Card networking, meaning discounts for locals. And, if you do follow them on Twitter or Facebook, they also offer discounts on these. While the coffee itself might not be at the forefront of this café, it makes up for it with its food, service and embracing of the local community/family feel. Like a pair of old trainers, it is comfortable, familiar and, while if not super fashionable, will probably be chosen ahead of that slightly uncomfortable pair of leather loafers you spent so much on.